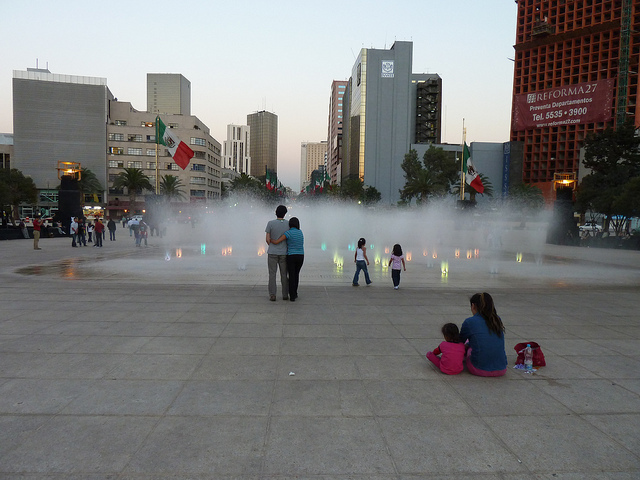 Creating open, inviting urban space in Mexico City, in addition to adding increased mobility, won the Capital this annual award. Photo by Dani Simons. Mexico City is the winner of the 2013 Sustainable Transport Award (STA). Each year, the Institute for Transportation and Development Policy (ITDP) awards cities with the STA. Mexico City was selected amongst a group of cities chosen across all geographies, scales and levels of development for their groundbreaking work in urban accessibility. The award is meant to showcase more livable urban landscapes and ultimately, a more sustainable urban future. Mexico City interlaced these concepts into an urban fabric that has integrated the newest and 4th line of Mexico City’s bus rapid transit through the city’s historic core, while simultaneously reforming street parking, expanding its public bike-share system and revitalizing urban spaces such as Alameda Central and Plaza Tlaxcoaque. Rio de Janeiro, the runner-up for the STA, was selected for expanding its bike sharing program as well as pioneering the first line of its world-class BRT system,Transoeste, in partnership with EMBARQ Brasil. The award will be presented to Mexico City Minister of Transport, Rufino Leon tonight in Washington, D.C. in a ceremony hosted by Enrique Peñalosa, former mayor of Bogotá, Colombia and Janette Sadik-Khan, Commissioner of the New York City Department of Transportation. Holger Dalkmann, EMBARQ Director, will present some remarks to congratulate the winner and cities receiving honorable mentions. Past winners range from Ahmedabad, India to Bogotá, Colombia to San Francisco.